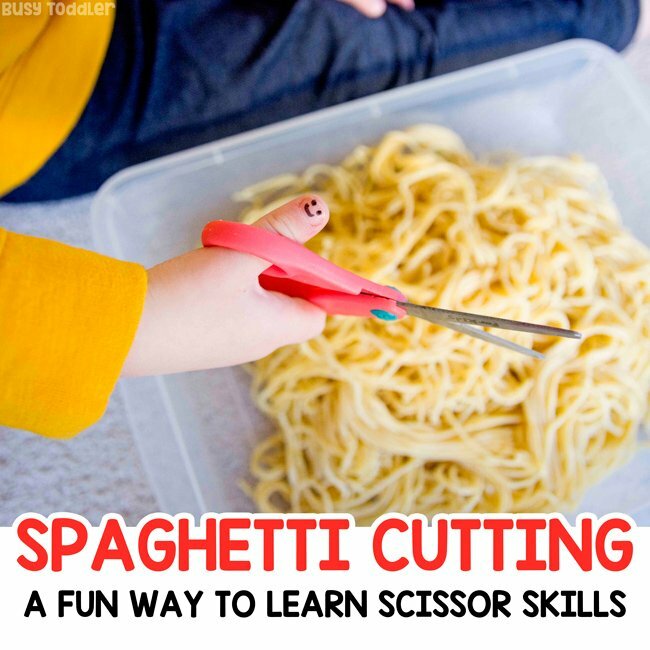 Teaching scissor skills? 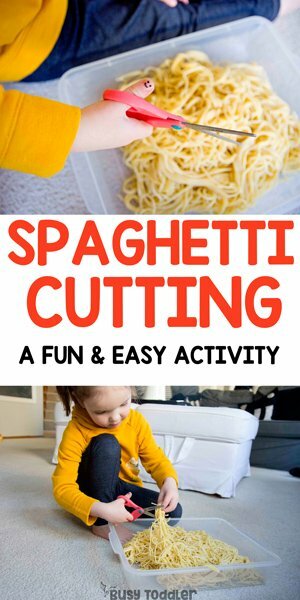 Make it fun with spaghetti cutting! Don’t forget to teach the basics. Sometimes with early childhood, we get in such a rush to teach reading, writing, and math that unwittingly forget there are some incredibly important life long skills kids need to develop too…and that they need just as much help learning to do as say, learning to read. We can’t overlook these life skills just because memorizing letter names seems “cooler”. Up to bat today: let’s make sure kids go to grade school knowing how to use scissors. 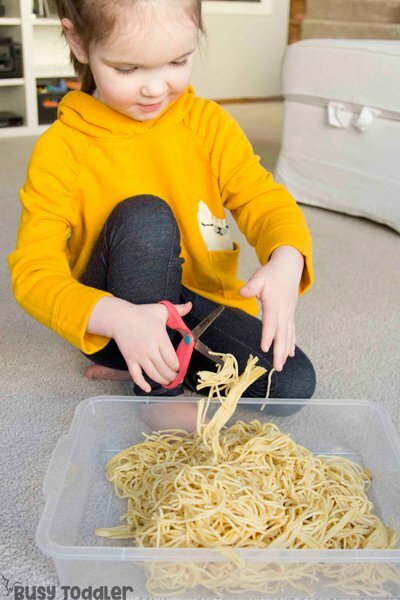 This spaghetti cutting bin is a riot and an awesome way to practice scissor skills. RELATED: Curious how I introduced these kinds of skills to my kids? 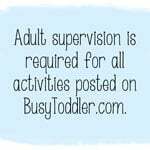 Check out Playing Preschool. Scissor skills are just that: SKILLS. They need to be introduced, taught, and mastered through practice. 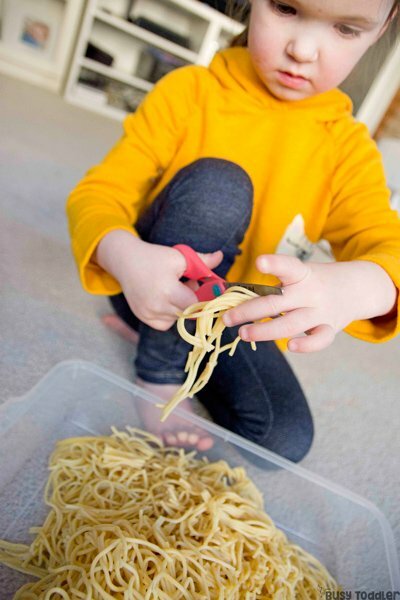 If we forget to let kids experiment with scissors, use them, or test out their skills… they won’t actually learn how to cut. This is a real problem facing kids today: they aren’t using their hands enough to develop skills like cutting. 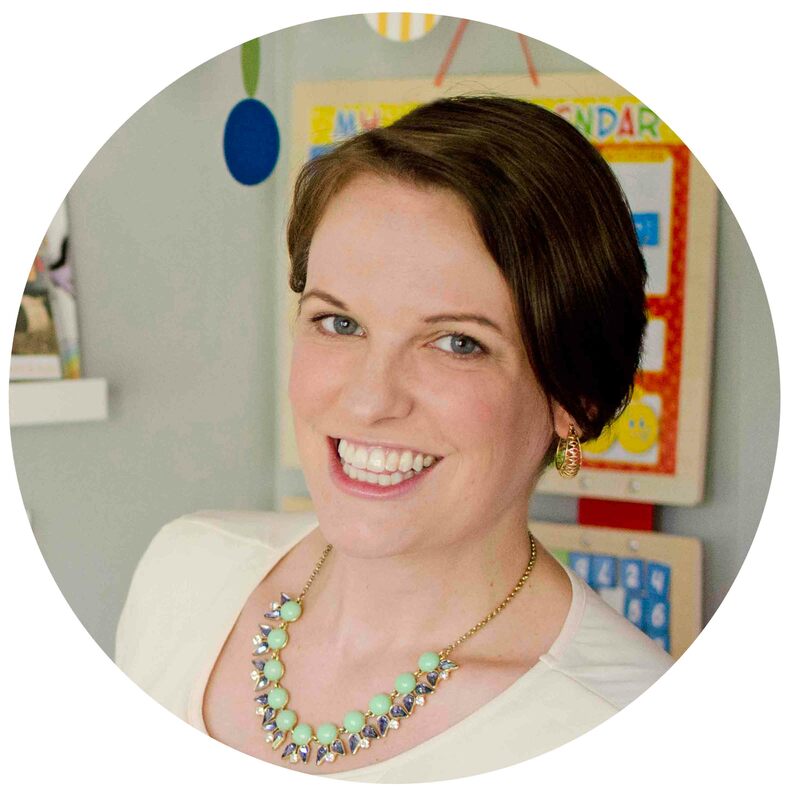 RELATED: Here are my most important skills for Kindergarten Readiness… it’s not what you might expect. And give them a few helpful hints along the way. Make sure your child has a good pair of kid scissors. Make sure you understand the progression in scissor skill development. Most of all…. make sure you know the smiley face trick. 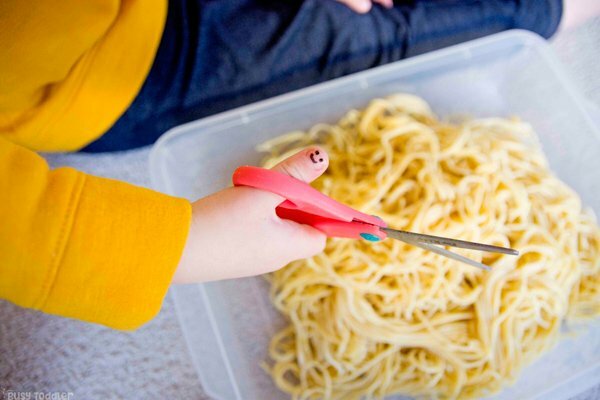 When a child is learning to cut, the inclination can be to turn the scissors sideways or upside down but this actually prohibits the use of the scissors. So how do we teach kids to keep their thumbs up? By adding a little smile to their thumb. This gives a very concrete and real way to remember how to hold scissors. 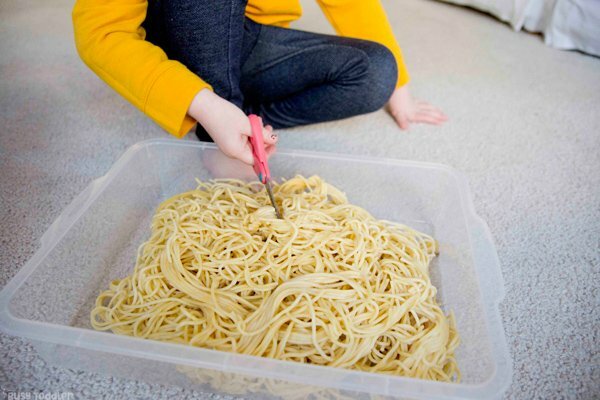 And now to practice with our spaghetti cutting bin! Anyone else a convicted OVER spaghetti cooker? I can never get the amount right! Even after the left overs were packed up – I had overloaded the spaghetti amount. Whoops. 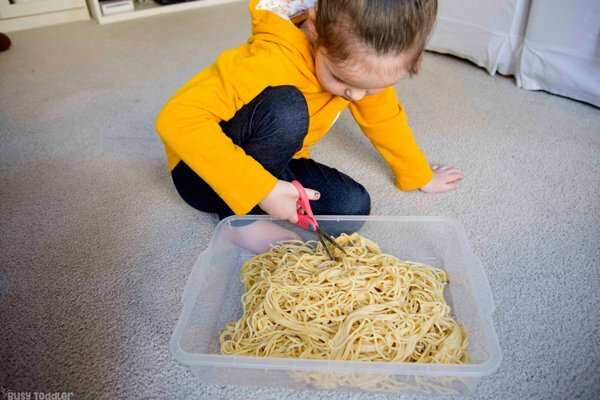 Instead of throwing it away, I decided to use it first as a fun spaghetti cutting bin for my 4-year-old. There was no fancy set up. 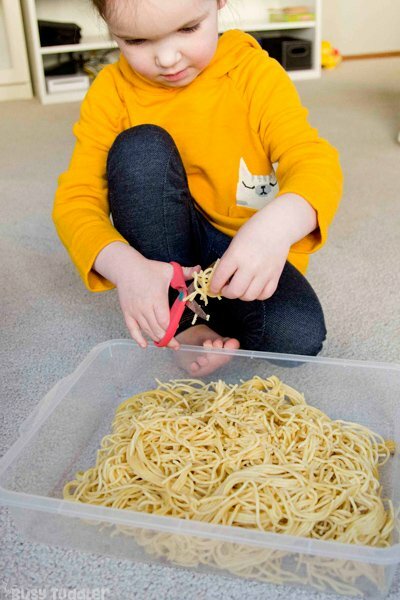 All the left over spaghetti went into a storage container, I grabbed some scissors and made the little smiley face on her thumb. This was such a fun and inviting way to practice her cutting skills – especially the fun of something other than paper. The added “sensory bonus” made this such a great two-in-one activity. 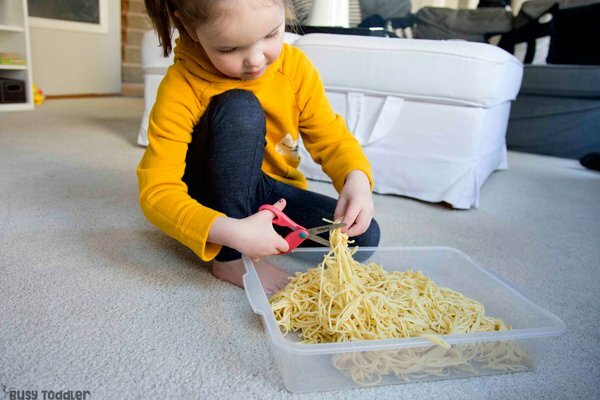 We ended up saving the spaghetti in a ziplock and playing this cutting game for a few more days. Scissor skills are so important! It’s so easy to look past scissor skills. 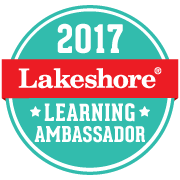 They aren’t as glamorous as learning numbers and no one is going to post a #bragging video of their kid using scissors properly. But the truth is – this is a massively important skill and one that can’t be overlooked. 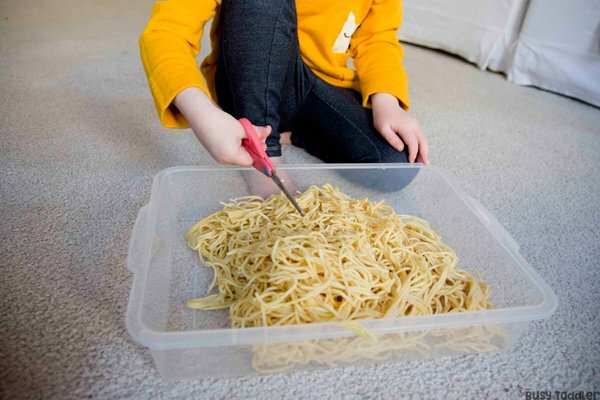 Next time you cook pasta, save some leftovers for this spaghetti cutting bin. 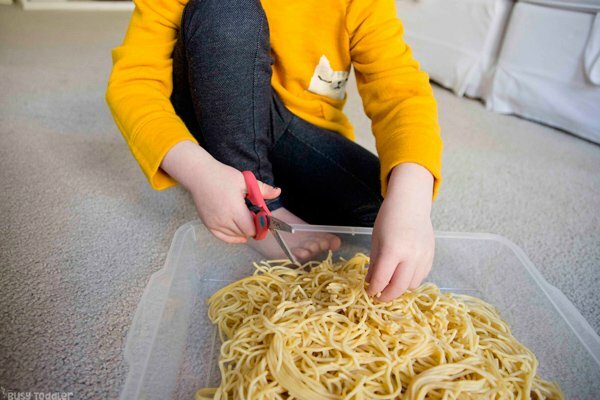 Will you make a spaghetti cutting bin?